While I agree in theory, in practicality I tend to disagree, because I take an outcome - oriented view of the voting process. At this point, one of two options are going to happen in this campaign. But that's me, and I strongly disagree with Clay Shirky. As for Nader, the only criticism I can think of is to ask whether their vote got them closer to what they wanted. I regard that as a weird special case anyway, with a lot of failure points. And of hell, there's the issue of down - ballot races as well; independents can and do win important regional and local offices. And in any case, voting at all is much more proactive than not voting. > I take an outcome - oriented view of the voting process. Exactly. Voting isn't some form of intellectual exercise or artistic expression. Our vote does not "mean what we want it to mean". We vote to influence the outcome of an election. Somebody is going to win - you can either influence that result, or not. What outcome do you anticipate with your third party vote? Let's say that you don't just vote for your third party candidate - you canvass for them, and *double* their vote from 4% to 8%. What outcome have you produced? Let's say that you voted for the candidate with 49% of the vote. What outcome have you produced? Your vote accomplished nothing, so was it wasted? 8% of the vote might not mean much, but it definitely influences the outcome of a vote. 8% is more than zero. Even not voting influences the outcome of the vote, or else why would voter turnout be such a big deal? > Let's say that you voted for the candidate with 49% of the vote. What outcome have you produced? That's a really great question, and the answer illustrates what I'm talking about. We don't vote with hindsight, knowing the result. We vote with limited foresight. The utility of our vote is anticipated utility. The closer the election, the more likely it is that my vote will be the deciding vote, and the higher my vote's potential utility. If I'm coming into an election where it's likely that my candidate will lose by 1%, it's also reasonable to expect that my vote could tip the scales the other way. A vote cast in a 49/51% race is highly likely to effect the outcome. On the other hand if I'm voting in a 4/47/49% election, or even an 8/45/47% election, it's clear that my vote for the 4% or 8% candidate is far less likely to effect the outcome of the election than casting that vote for the 49% or 51% candidate. Voting third party is a low utility vote for a foregone conclusion. Voting for someone guaranteed to lose lacks just as much utility as voting in a single-candidate race where the single candidate is guaranteed to win. Let's say your candidate is currently polling at 4%. You don't just commit to voting for them. You don't just publicly commit, hoping that others follow suit. You also commit to canvassing for them tirelessly. And you're so deluded that you believe that your vote, and your support, will double your candidate's vote count to between 4% and 8%. What influence do you anticipate that your vote and campaign effort will produce? Let's reply to your fencepost-moving question with two questions. At what percentage of the vote does voting for a third party gain utility? And how do you propose that a third party reach that percentage if voting for them is of low utility? Let's reply to your fencepost-moving question with two questions. At what percentage of the vote does voting for a third party gain utility? It's a continuous nonlinear function, not a boundary. The utility of you voting for a candidate with anticipated zero chance of winning is zero utility. Vote utility increases as your candidate's anticipated showing increases. Utility is at maximum when two candidates are evenly matched. Utility decreases back to zero as a candidate becomes more certain of winning. This might sound confusing, so I will explain further with some examples. Daffy Duck is physically incapable of winning. It is absolutely impossible that your vote for Daffy Duck will help determine whether Daffy Duck gets to be President, so a vote for Daffy has a utility of zero. Vermin Supreme's likelihood of winning in a close race is basically epsilon (http://en.cppreference.com/w/cpp/types/numeric_limits/epsilon). A vote for (or against) Vermin Supreme is more likely to effect the outcome than a vote for Daffy Duck and therefore has a utility of epsilon, which is greater than zero. Jill Stein's likelihood of winning in a close race is better than Vermin Supreme's, but it's still vanishingly small. A vote for (or against) Jill Stein is more likely to effect the outcome than a vote for Vermin Supreme and therefore has utility > epsilon. Donald Trump and Hillary Clinton are not just the two most likely candidates to win, but to win in a close race against each other (which is the point). A vote for Clinton or Trump is more likely to effect the outcome of the election than a vote for any other candidate. Hillary is currently beating Trump by about 8%. That's a really healthy lead. In a universe where she was beating Trump by 0.1% your vote would be even more likely to effect the outcome of the election than it currently does, and its utility would be even higher than it currently is. Likewise, in a universe where Hillary was beating Trump 87% to 4%, a vote for Hillary (or Trump) would have the same utility as a vote for Stein in this universe. You should still vote for Hillary (or Trump) because that's still the action with the greatest relative utility - there's no closer race that your vote is likely to determine - even though its absolute utility isn't as high as your vote in this universe. Let's say that Obama was allowed to run for a third term. He's more popular than either Trump or Clinton, and he's polling 60%/19%/18%. Your vote is most likely to be a deciding vote between either Obama and Trump or Obama and Clinton but Clinton and Trump are close enough that we can't say who. Stein is so far behind that your vote won't decide the race between Obama and Stein or Trump and Stein. Therefore its utility is maximized (in that universe) by voting for Trump, Clinton, or Obama. That's a very long-winded way of saying, "I don't know." The percentage of votes a third party gets in the election can determine how onerous that party's process will be to get onto the ballot at the next election. The percentages, processes, and definitions of "major party" vary by state. So I just did a fairly deep dive on this. ronebofh is a California voter. The qualifying requirements in California (https://ballotpedia.org/Ballot_access_requirements_for_political_candidates_in_California) are the nomination of a political party, gathering a petition to run as an Independent, or running as a write-in candidate. I assume you're talking about the criteria a party must meet in order to be ballot qualified. In California that seems to be determined by a certain number of registrants (http://ballot-access.org/2015/08/29/california-bill-setting-up-rules-for-green-party-primaries-moves-ahead/), not the votes in the last election. So even if what you're saying is true, I don't think it's true for ronebofh. Can you give me an example of a state in which the party's votes in the last election determine the onerousness of that party's campaign in the next election? It was the rule in Pennsylvania until a court order in June (http://www.ydr.com/story/news/politics/elections/2016/07/01/minor-parties-get-easier-ballot-access-pa/86605528/). To summarize, because the statute is a wall of text, the rubric is complicated. The nominee of a political "Party" (which ends up being just the Republican and Democratic Parties) has to get just 2,000 petition signatures across the entire state to get on the primary ballot for president and senator. But if you are a minor party, your president or senator candidate has to get a number of signatures equal to 2% of the number of votes won by the candidate for at-large office at the last general election. Compare Section 912 to Section 951 in the statute as it's currently written (PDF) (http://www.legis.state.pa.us/WU01/LI/LI/US/PDF/1937/0/0320..PDF). The definitions of "party" and "political body" are in Section 102 and cross-referenced at Section 801. EDITED to add and clarify: your "political body" doesn't qualify for political "party" status until your candidate gets 2% of the total vote cast in the state, and 2% in at least 10 counties, in the general election immediately preceding the primary or general election you're trying to get signatures for. (See Section 801.) That is to say, if you don't get that 2% plus 2% in one general election, you're stuck having to get 21,000 versus 2,000 signatures to get on the ballot for the next general election. Your question was, Can you give me an example of a state in which the party's votes in the last election determine the onerousness of that party's campaign in the next election? and that's the answer. The stated public policy for this scheme is to keep frivolous candidates off the ballot. The counter statement is that there's no such thing as a frivolous candidate in a democracy. The way the law plays out on the ground here is that the Constitution and Libertarian parties can usually get their candidates on the ballot, while the U.S. Taxpayer and Green parties tend to be more hit-and-miss, especially in non-presidential election years. For the 2016 election, without the June court order, the signature threshold for non-major parties would have been over 21,000 -- more than 10 times the requirement for the established (more like "establishment," amirite) parties. So there's a court order in place now, and I'm not sure what will be happening with the state's ballot access law. There's an HB 342 (PDF) (http://bit.ly/2aSlHif) in the House Rules Committee, (full status page in case the bit.ly link goes away) (http://www.legis.state.pa.us/cfdocs/billInfo/billInfo.cfm?sYear=2015&sInd=0&body=h&type=b&bn=342), that would codify the 2,000 signature threshold for all "parties" and "political bodies." At least one minor party, though, isn't happy with HB 342 (PDF) (http://ballot-access.org/wp-content/uploads/2016/06/our-objections-to-HB342.pdf), because it requires a county-by-county strategy that isn't feasible for parties with regional, rather than state-wide, support and resources. They present some caselaw in the letter that translates their feasibility issues into constitutional ones; I wish them luck. IIRC Democratic Governor Wolf has indicated he'll sign it; but he and the General Assembly don't often get along too well, so he may not actually have it delivered to him any time soon. I didn't know this, and I take your point that voting for a third party in Pennsylvania means they need 19,000 fewer signatures to get a name on the ballot. What's the benefit of that, other than to a dozen or so petition gatherers who don't have to spend a couple of weekends collecting signatures? Has the party that ronebofh wants to vote for ever failed to get their candidate on the ballot because of the onerousness of the rules? Because this brings us back to my original question. Let's say that ronebofh moves to Pennsylvania and he doesn't just vote Green. He canvasses tirelessly, so that instead of getting 21,341 votes in 2012 (https://en.wikipedia.org/wiki/United_States_presidential_election_in_Pennsylvania,_2012#General_election) they get more than five times as many votes, the 115,071 required to meet the 2% minimum. Then what? The party has a dozen extra people who can spend two extra weekends building party support so that they get 3% of the vote instead of 2%? To what end? Can't speak for everybody, but I think the conventional wisdom is that it may do two things. One, it may put the two major parties on notice that a significant number of citizens are dissatisfied with the current status quo and want to see alternative solutions, new faces, etc., in government. If the Greens can get on the ballot regularly and get a good number of votes, maybe the Democrats will move the planks in their environmental platform a little more to the left. If the Libertarians get more votes, then maybe the GOP will, I don't know, privatize the New Jersey Turnpike, end the Fed, and abolish property taxes and public schools. Two, there's a hope that it can create a snowball effect of larger and larger percentages of the vote every cycle. 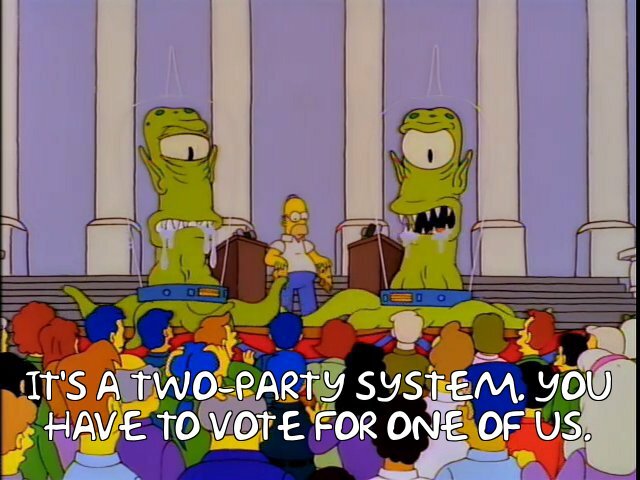 The hoped-for end result (after who knows how many cycles) is that we get a three- or multi-party system rather than the perceived Tweedledum and Tweedledee, "they're both in bed with Wall Street and Big Pharma and Big Agro, but I can't 'waste' my vote on a third party" choices we have now. In other words, the conventional wisdom suggests that it's a long game for disestablishing the two main parties. Two percent doesn't mean much, and neither does 3%. But next time maybe this November's 3% will turn into 6% in 2020, or 10% at the 2022 Congressional mid-terms. Next thing you know we have more than two so-called "Independent" members of Congress. Or the states have a few third-party politicians working on their re-districting, re-drawing the gerrymandering that's kept so many state legislatures solidly Republican and skewed the House of Representatives the same way. I'm with the "get serious about building up your party at the local level first" school of thought on this. It's reasonable to ask for proof of seriousness and viability before investing your one and only vote for President. I am thrilled, however, to see you in arguing trim! I generally agree that votes for candidates who are unlikely to be elected are not necessarily wasted. Using your vote to endorse the policies of someone who is unlikely to win a seat can send the elected person a message that you (in aggregate with your fellow third-party and independent voters) value a collection of policies and positions that weren't represented by the eventual winner. This is one way in which policies and views are changed. Up here in Socialist Canuckistan we're working on changing the electoral system to make the results of voting more reflective of what people are voting for (or against, if they poll that way). It's one tool to help things along by providing more direct, proportional representation. Using all your votes at all levels and communicating with both candidates and elected officials are steps people can take to make their democracies more representative of what people want and need. The "need" part matters to me because I see my vote as endorsing someone (or a collection of people) to work with constituents, understand issues, do what is best within party constraints if applicable, and communicate with people (colleagues and constituents) about the reasons for their support (or lack thereof) for specific legislation&c. It depends what you mean by "wasted". If I have a bottle of 1989 Haut Brion and I use it to clean my bathtub, people will say I've wasted it. Even if we all agree that it's mine to do with as I like. It's not that I owe that bottle to anyone. It's not that other people failed to earn the bottle from me. Something is wasted if it's used in a substantially less productive way than it could have been. Saying "it's my bottle and I can do what I want with it" doesn't get me off the hook. That analogy is so bad that you could be a Trump voter. Good job. And that ad hominem was so free of specifics that you could have just called me "Crooked Tongodeon" to the same effect. I stand by my analogy because I think it accomplishes what I'm trying to explain. You've got a bunch of red herrings in your argument that you need to put aside. Nobody thinks your vote isn't your vote. Nobody thinks you owe it to anyone. Nobody thinks you shouldn't cast it however you feel like casting it. And nobody thinks that a vote for a third party is completely without utility. We think that you should feel like casting your vote to make maximum use of its utility. Making sure that Jill Stein gets 8% instead of 4% is a weaker outcome effect than making sure that Hillary gets 52% instead of 48%. You keep saying "nobody" and yet this is a sentiment that I've seen expressed many times over the years. Making sure that Jill Stein gets 8% instead of 4% might not look like much this election, but it may very well lead to 12 or even 16% in the next election. Voting doesn't exist in a vacuum. And that's why the concept of vote utility on its own is not persuasive. The purpose of voting is more than just expressing your political opinion. If you want to express your political opinion you can give a speech, write an LJ post, or display a provocative sign. But voting is unique, in that it directly influences the outcome of a specific election. If I don't cast my vote, will my vote be wasted? I think so. I have the opportunity to influence the outcome of the election, and I'm choosing not to. If I spoil my ballot, will my vote be wasted? I think so. Destroying my ballot so that it can't be counted is less productive than casting a vote that could be counted. If I write in "Daffy Duck", will my vote be wasted? I think so. Voting for a ridiculous imaginary candidate is essentially the same as not voting at all. If I write in "Franklin D. Roosevelt", will my vote be wasted? I think so. Franklin D. Roosevelt would certainly be a much stronger candidate than anyone running this year, but he's not going to win because he is dead. If I write in "repeal the second amendment", will my vote be wasted? I think so. Voting is more than simply a platform to express my political preference. Voting is a means to effect the outcome of the election. A vote for Jill Stein or Gary Johnson has substantially more utility than a vote for Franklin D. Roosevelt or Daffy Duck. It's at least hypothetically possible not just that they could win, but that your vote could influence their selection. But it has substantially less utility than a vote for Hillary Clinton or Donald Trump, because it's vastly more likely that your vote will influence their selection. This isn't an intellectual exercise. It's a near-certainty that either Clinton or Trump will win. You can either use that vote to its full potential by placing it on one side of the scale, or you can limit its potential influence by stepping back and living with the result of a choice that other people's votes have made for you. The actual reality is that we live with the choice that other people's votes have made for us, regardless of whether we voted along with them or not. Your hypothesis only holds value for anyone who wants to feel like they won the vote, or that they lost, somehow, to the opponent. Of course we do. Every single vote - including the votes that we've cast for winning candidates - was won almost entirely with other people's votes. The question is whether you'd like to effect that outcome, whether you'd like to opt out by not voting at all, or whether you'd like to effectively opt out of effecting that outcome by voting for a fictional (Daffy Duck), dead (Herbert Hoover), or impossibly unlikely (Jill Stein) candidate. I'm making an ethical argument, not attempting to explain physical evidence, so this isn't a hypothesis. Votes are cast before they are counted. You can't retrospectively determine the utility or ethics of your voting choice based on the final outcome, because that information wasn't available when you cast your vote. But we certainly hold reasonable expectations about what's likely to happen. My argument holds that vote utility (not value) is exclusively determined before the votes are counted, based on the apparent likelihood of the various future outcomes. My argument holds value for anyone who wants to feel like their vote effected a future outcome. If you don't care about effecting a future outcome then my argument doesn't apply to you. But since that's literally the unique purpose of voting then maybe you don't understand voting. Every vote affects the future outcome. Anyone who feels like their vote didn't affect the outcome doesn't understand voting. Your vote can affect the choice for President if it's in a state that's close in an election that's close. The most recent example when things came down to one close state was Florida in 2000. > Q: When the votes were recounted in Florida, who won the 2000 presidential election? > A: Nobody can say for sure who might have won. A full, official recount of all votes statewide could have gone either way, but one was never conducted. So, in the only recent instance where a single vote might have mattered in the outcome, our great US democracy didn't count it. If you are talking about actual votes for US President, you should look at what actually happens in the US Presidential election. ...wow, LiveJournal is so much more civil than Facebook. That's because nobody here is repeating myths that have already been debunked in the linked articles. tongodeon.livejournal.com - It depends what you mean by "wasted".